DUP LEADER ARLENE Foster has delivered another broadside to former power-sharing partners Sinn Féin. Speaking at the party’s spring policy conference in the Tullyglass Hotel, Ballymena, Foster accused Sinn Féin of delivering nothing. Both parties have been deadlocked now for over 14 months when the Stormont Executive collapsed – leaving Northern Ireland without a functioning Assembly. The DUP last month collapsed talks after disagreement on an Irish Language Act. 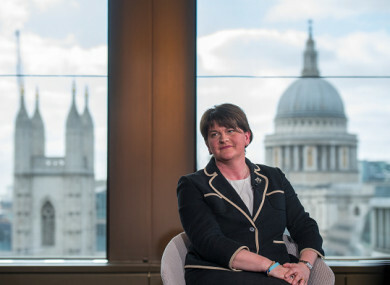 Foster said that she “respects the Irish language” but that her party cannot agree to a standalone Irish Language Act, as is sought by Sinn Féin. Speaking today, Foster sent accusations back to Sinn Féin. “This week, the Secretary of State placed a Budget for Northern Ireland before the House of Commons. It was a Budget that had the hallmarks of this Party as the resources promised in the Confidence and Supply Agreement began to flow. £410 million of additional spending without which a difficult Budget would have been far worse. “People are starting to see that not only were the naysayers who doubted that the Confidence and Supply money was real were very, very wrong but that the DUP deliver for everyone in every part of Northern Ireland. What are Sinn Fein delivering for our people? The answer is short and simple – absolutely nothing. Sorry, that isn’t entirely fair. Sinn Féin are at least trying to deliver. They are trying to deliver division and dysfunction. But we are not going to allow them to hold Northern Ireland to ransom any longer. Foster’s comments come after Britain’s Labour Party leader Jeremy Corbyn sacked shadow Northern Ireland secretary Owen Smith. Smith said that he had been sack over his views on the damage Brexit will do to the Good Friday Agreement. Corbyn has described Smith’s replacement Tony Lloyd as “committed to ensuring that peace in Northern Ireland is maintained”, and will work to get devolution “back on track”. Email “'What are Sinn Féin delivering? Absolutely nothing' - Foster says DUP won't be held to 'ransom'”. Feedback on “'What are Sinn Féin delivering? Absolutely nothing' - Foster says DUP won't be held to 'ransom'”.